Let the games begin! 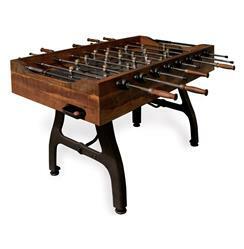 This exquisitely crafted iron foosball table is set to elevate your game room to the highest of heights. Constructed from rich reclaimed hardwood in deep mahogany tones and featuring handmade aluminum players, this is a foosball table like none other. A stone playing surface ensures absolute accuracy, while solid construction guarantees sportsmanship for years to come. Enjoy a one year warranty on this piece.